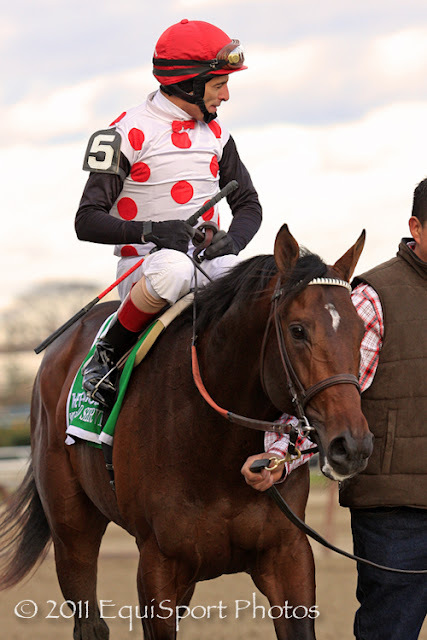 Turf & Dirt - On Horse Racing: "Soldat Stamps Ticket" - Derby Top 21 for February 28th. "Soldat Stamps Ticket" - Derby Top 21 for February 28th. SOLDAT made a nice move in the Fountain of Youth, jumping from post position #1, to take the early lead into the clubhouse turn. He never looked back, stamping himself as a legitimate Derby contender. The front running style was reminiscent of THE FACTOR, another War Front colt. Soldat, trained by Kiaran McLaughlin and ridden by Alan Garcia, won for the first time on a fast dirt track. A point that had raised a few question marks. “Going into the race, I wasn’t concerned about that at all. He’s always trained extremely well over a fast track, but it is nice to finally get it in print that he likes it fast,” McLaughlin said the day after the race. So what I'm trying to figure out, from my Monday morning quarterback chair, is why do I have Soldat at #5 and The Factor at #21? Both colts, graduated from Allowance company, to won in gate to wire fashion in their first Stakes race. The big question is the pedigree... can the War Front colts make the classic distance. Soldat's performance was certainly the more visually impressive in winning the Fountain of Youth, setting reasonable fractions and drawing away in the stretch. The Factor, in contrast, set suicidal early splits, and just held on at the wire to a fast closing SWAY AWAY in the San Vicente. We would hope for the question to be answered in the next starts by these two, Soldat is bound for the Florida Derby, while The Factor's next start appears to be the Sunland Derby. Hmm... will the Sunland Derby really tell us anything? GOURMET DINNER also proved he belongs in the Derby conversation with a nice 2nd place in the FOY under Ramon Dominguez. Having won the Delta Jackpot Stakes, and accumulating enough graded earnings last year, one could only wonder if the qualifying criteria should be changed. But much to the credit of trainer Steve Standridge, the Trippi colt has shown up to gamely challenge his peers. TO HONOR AND SERVE seemed to get enough out of the race to continue forwardly. With already plenty of graded earnings, the son of Bernardini made good use of his first start since the Remson last November. He appeared in good form finishing 3rd in the Fountain of Youth, ridden by John Velazquez. Your last post...I loved the runners-up in the three stakes you wrote about: SWAY AWAY, SANTIVA, and J.P.'S GUSTO...all were making their first starts as 3y.o. 's after varying stakes success as juveniles. Each lost to winner's w/ recency advantages. Last weekend: I'm looking for INDIAN WINTER to rebound in a big way after a 3rd @ TuP...he was trained for the 7f San Vicente and Hollendorfer audibled to the 1 1/16 miles Turf Paradise Derby to avoid THE FACTOR; TO HONOR AND SERVE ran like a short horse...Mott has a plan with him and the FOY was not the goal, merely a step along the way; SOLDAT got away with a rail trip, soft pace in the FOY...what does he do in a realistically paced event? 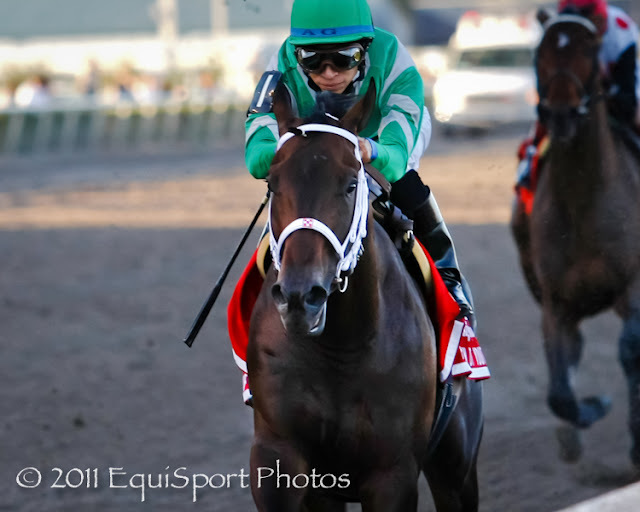 I'll love to play against him in the Florida Derby particularly if FLASHPOINT or TRAVELIN MAN join the pace party. The Hutcheson winner FLASHPOINT was so very impressive putting away TRAVELIN MAN. There had to be a reason he's gotten such a late start...perhaps it's the same reason Dutrow waited on BIG BROWN, a son of BOUNDARY, FLASHPOINT's grandsire. Hard to envision a maternal grandson of TWO PUNCH as a Derby winner, perhaps this will be this year's version of D'FUNNYBONE. Whaddya make of UNCLE MO's Timely Writer prep? Great to have you as part of the membership. I have always enjoyed your photos. You have a great "eye" and a lot to offer.